Physiotherapist, Rhodri Parfitt, has recently joined Jewellery Quarter-based back and joint centre, Optispine Birmingham. He brings a new dimension to the team with a particular focus on exercise rehabilitation. Rhodri’s interest in physiotherapy evolved from his love of sport. A keen cricket player, swimmer, cyclist and runner, he experienced a range of injuries that resulted in him requiring extensive treatment. With a first degree in Biology, Rhodri later completed a Masters in Physiotherapy at the University of Birmingham. He now divides his time between an NHS Musculoskeletal Physiotherapy role and private work for Optispine. 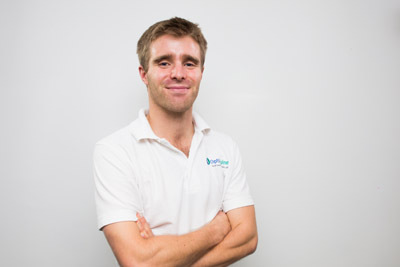 Rhodri’s services, now available at the Optispine centre on Vittoria Street, include hands-on physiotherapy, hydrotherapy, one-to-one exercise sessions and a brand-new Physio Back Care Class, starting on 12th June at 6pm. In the summer, he will also be taking the Chartered Society of Physiotherapy’s highly popular Workout at Work campaign to local companies, promoting the ‘Fit for Work’ message through free physio fitness sessions.